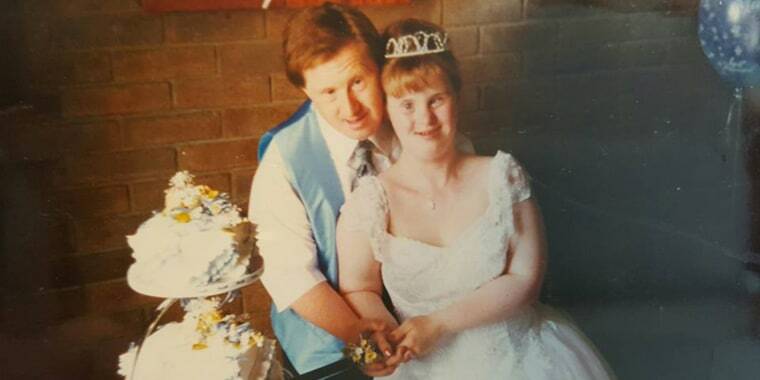 When Tommy and Maryanne married almost 23 years ago, people believed it would never last because both of them have Down syndrome. They've proved critics wrong. Tommy and Maryanne Pilling haven't let fame change their relationship. Facebook fame, that is. Last year, after the couple shared their tips for a happy marriage, their Facebook page, Maryanne and Tommy, gained followers. Today, their account has over 30,000 fans. This year, the couple, who both have Down syndrome, will celebrate 23 years of marriage — and Tommy just turned 60 years old. They're as in love as ever. “Their advice is still the same — to be honest and to spend time together as much as possible," said Lindi Newman, Maryanne's sister, who manages the couple's Facebook page. The two met more than 23 years ago and began dating. After 18 months, Tommy knew he wanted to marry Maryanne. But Tommy didn’t have enough money to buy a ring. So, he got creative and bought a plastic ring from a vending machine to propose to Maryanne. When Maryanne’s mom, Linda Martin, realized Tommy planned on using a plastic band, she took him to a jewelry store to help him buy a ring. This proposal caused Maryanne to “jump with joy.” At the time, some criticized Martin for allowing the two to marry because they didn't think people with Down syndrome should, or could, have a serious relationship. But Maryanne's family disagreed. Maryanne's mom continues to be the couple’s biggest supporter. Recently, Tommy underwent cataract surgery and the couple moved in with her for three weeks as he recovered. The couple keeps defying critics who believed the marriage wouldn’t last. “What keeps their marriage so strong is that there is never a hidden agenda. They love each other with their whole hearts and are honest with one another,” said Newman. This month the couple hosted a party to celebrate Tommy turning 60 years old, which coincides with World Down Syndrome Day on March 21. Friends, family and neighbors joined the couple to toast Tommy. “He (had) a huge birthday party to celebrate,” Newman said. While their marriage is based on love and honesty, it’s also successful because they're well suited for each other. Maryanne, 46, loves to talk and Tommy is reserved and quiet. “He sits back and listens, and she likes that,” Newman said. While Maryanne works one day a week at a local charity store, the couple spends a lot of time together. They bowl, golf, see movies, go to theme parks, go out for dinner and drinks, and spend time with family. Recently, they’ve become more adventurous in the kitchen. “(They) are doing some more cooking and baking,” Newman said. They live in their own apartment, which is next to Maryanne's mother's and across the street from Newman and her husband in Southend-on-Sea in England. This summer they’re going on a surprise trip to Euro Disney with Newman, her husband and children. “One of Maryanne’s favorite films is ‘Frozen,'" Newman said. “They’ve both always wanted to go, and it will be a dream come true for them." Newman hopes others learn from her sister and brother-in-law. “Anything is possible with love and there should be no limitations for anyone, no matter what their circumstances are,” she said.